THE Prime Minister has been known to bide his time before making up his mind. Some say he's indecisive; others call him meticulous. But on US President Donald Trump's shocking move to recognise Jerusalem as Israel's capital, Najib Razak didn't blink an eye. At the Umno General Assembly this morning, he wasted no time in setting the Malaysian agenda on Jerusalem: Malaysia will never accept Jerusalem as capital of Israel. "As Umno president and Malaysian prime minister, I call upon all party leaders, delegates and members here and out there, wherever they may be, to stand and express your stand with confidence ... so that the world will hear the voice of Muslims in Malaysia, that we vehemently reject the proposal to recognise Jerusalem as Israel's capital for all times". Those expecting the Prime Minister to be coy because this concerns the most powerful nation on Earth are mistaken (What say Najib on Trump's Jerusalem's move?). Trump may regard Najib as a "good friend' and vice versa but the US President won't have Malaysia's support on this. Over the next three days, the Umno general assembly will set the Malaysia's biggest political party's agenda on Jerusalem. Barisan Nasional's other component parties will no doubt pledge solidarity on this, just as they have done over the years. It would be interesting to see if Pakatan Harapan will follow suit. The Opposition's interim PM-designate Dr Mahathir Mohamad was a champion of sorts for the so-called developing countries of the South, for Palestine and South Africa, and for Bosnia during his 22 years as PM. But in cahoots with the DAP, who is known to have a different view on some of these issues (PKR-Amanah, PPBM membisu isu Jerusalem Jubilee sebab DAP, dakwa NGO), Dr M may have to sing a different tune. If he did, it wouldn't surprise too many people. But let's hope that won't be the case. 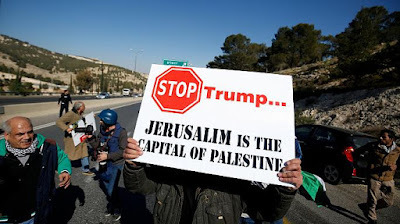 We need to be united on the Jerusalem issue. How I wish that Najib's tone in when addressing against Trump move on Jerusalem in the audience of UMNO delegates, would be same when addressing...e.g., before Trump in person, the UN congregation, foreign reporters, etc. Adakah najib akan menarik balik niat untuk meningkatkan ekonomi amerika? Adakah najib akan membatalkan pembinaan king salman center? Adakah najib akan menarik balik tentera malaysia yg dihantar secara senyap berperang bg mengikut telunjuk saudi? "THE Prime Minister has been known to bide his time before making up his mind. Some say he's indecisive; others call him meticulous." For example, "next Tuesday" to sue the WSJ was a long time ago. All the money MO1 paid the lobbyists for that photo-op with Trump. How do we (the rakyat) get a refund?